The bars are where the hoof wall ends on either side of the wall, creating the outer side of the collateral groove and curving forward at the heel. One of the weight bearing structures of the hoof. 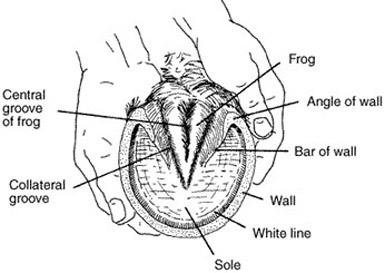 Also called the sulcus, this groove runs down the center of the frog and extends up between the bulbs of the heel. Two deep grooves that extend in a triangle form around the frog structure. An elastic, wedge-shaped mass of tissue which makes contact with the ground first when a horse hoof strikes the ground. It is split down the middle by a central groove and the collateral groove runs along either side of it. One of the weight bearing structures of the hoof. The area surrounding and slightly above the frog which does not come in contact with the ground. The outer, insensitive covering of the hoof, similar to a fingernail. The wall surrounds the coffin bone and grows continuously. One of the weight bearing structures of the hoof. In front feet, the wall is thickest at the leading edge, in hid feet thickness is more uniform all around the hoof. A line of distinction between the insensitive outer hoof wall and the inner area of the hoof which contains sensitive nerves and vulnerable blood vessels. This line can be seen on the bottom of the hoof and is similar to the quick of a fingernail. Know that you know the anatomy of your horses hoof, why not learn about their feet and the rest of the the animal? 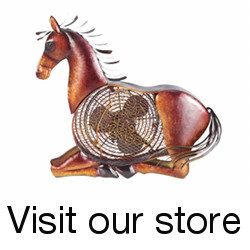 This entry was posted in Horse Basics on January 20, 2009 by The Equinest. Good, but just not enough information and pictures. A good little sketch, enough info. to encourage further reading. Good, basic info for a beginner learning about the hoof.